GB: When did you first decide to create an expansion for Dungeon Siege? How long has Legends of Aranna been in development? Tara: Microsoft wanted to do an expansion pack as soon as Dungeon Siege was released. We've been talking about the expansion for a long time. Microsoft & GPG only wanted to do the expansion with the right partner, and they wanted to make it great. Once all of our schedules synced we designed what we all thought would be the right expansion, and let the schedule fall out of that. 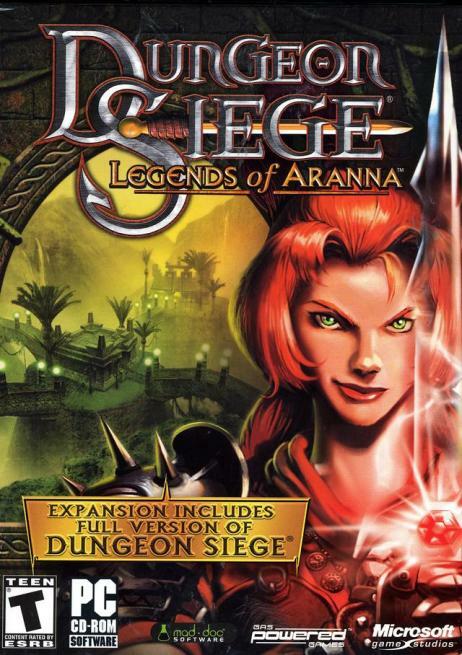 The dedication to really creating a quality game by everyone involved in the product has made it a rewarding experience for everyone involved and led to the creation of an expansion that will add to the reputation of the Dungeon Siege franchise. GB: What is the general storyline behind the expansion and what goal will the player be trying to accomplish? Tara: You are the last of a long line of heroes. Your journey through the adventure is propelled by two forces solving the mystery of what happened to your parents who disappeared many years ago, and stopping an old and malevolent evil from destroying the world. You begin in a remote corner of the Kingdom of Ehb, but soon continue on to the near forgotten Island of the Utraeans. GB: Can you tell us a bit about the AI and UI enhancements that will be implemented with the expansion? Tara: We spent a lot of time looking for ways to streamline gameplay. One of my favorite additions is the Redistribute Potions button. Typically, all your potions will eventually end up clumped on your packmule. Before battle, you simply click the new button, and your melee fighters end up with the bulk of the health potions, and your mages have the mana potions. It's incredibly useful. I find myself hitting the '˜R' hotkey all the time to keep my thirsty fighters well supplied! Another addition is the Sell All button in shops. You can sell everything in a party member's inventory at the click of a button. There are several options to choose from, so you can hang on to your potions or spells, and just sell everything else. This feature lets you spend less time shopping and more time doing battle. GB: How many new monsters, spells, and NPCs capable of joining the player's party are you looking to implement? I know it's a bit early, but can you elaborate on any of your favorites? Tara: There are over 100 new monsters in the game. There are two main races you encounter on the Island the Hassat and the Zaurask. The Hassat were evolved from the great cats, and you'll find them in Leopard, Panther, Lion and more varieties. The Zaurask are a lizard people, at war with the Hassat. You'll find them dwelling in tents made out of the hides of the Hassat, and adorned with skulls as trophies of their prowess. We've added loads of new spells as well - over 70. One of the coolest types is the new (Orb) spells, cast by both Nature and Combat mages. The orbs circle their caster's head wreaking havoc on your enemies or helping party members. The Orb of Healing is great it heals your party members in a burst of color. GB: Have you done any tweaking to any of the spells in the original game, perhaps to make some of the more underutilized ones more likely to be used? Tara: Our upgrade to the Control Groups really helps in this area. We've expanded game functionality to allow you to bind specific spells to up to 10 hotkeys. I always set key number 1 to be my combat configuration. Key number 2 is healing, with my Nature Mage on Healing Hands. Key number 3 is an alternate combat arrangement, with my Combat Mage on a curse spell like the new Diminution, which shrinks enemies to a quarter their size. Then I set all my mages to their Orb spells with key number 4, and key number 5 is reserved for summoning spells. I regularly switch between all these groups before combat and in the heat of battle. This really lets you get the most out of all the spells in your spell book and makes it really fun to play with your magic users. GB: You've mentioned that mages will be able to transform into different creatures with some of the new spells. What advantages/disadvantages will these transformations present to the character? Tara: The transformation spells are really exciting. They take your mages out of the background and move them right to the forefront of the battle. When your Nature Mage turns into a wolf, he is no longer a healer: he's now a powerful melee fighting force. He can run right up into the midst of a furball and deal damage side by side with your melee fighters. The tradeoff for this is that the mages can't cast spells while transformed. So make sure to cast all your buffs, summons and orb spells before transforming! And if you realize you really need some healing, you can untransform before the spell runs out by clicking a button.